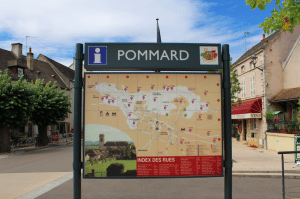 A stone’s throw from Beaune, the next stop on the Route des Grand Crus south from Pommard ; the village of Meursault. It is world-renowned for its Chardonnay: the grape thrives here more than anywhere else in the Côte de Beaune. Château de Pommard’s current Meursault vintages 2011, 2012, and 2013 come from grapes planted the Vireuils plot. It is in the high slopes of the village’s hills, where we can find remarkable soils. From here, the wines receive and express minerality, fruitiness, a creamy, buttery, texture and finesse. With a touch under 1000 acres of vineyards in the village and a population of no more than 1,500 people Meursault’s rise to acclaim is entirely due to its the production of Chardonnay. Despite not needing much of an introduction for several centuries, Meursault’s reputation always preceded its quality. 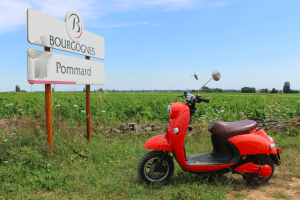 However, after becoming an AOC in 1970, one of the last to join the club ; the AOC began in 1936 – Pommard being one of the first appellations to be classified ; regulators ignored the appellation since. Unbelievably, none of Meursault’s vineyards were ever granted Grand Cru status before. The village’s reputation today as one of Burgundy’s most acclaimed Chardonnay growers is purely down to the winemaker’s hard work. The wine does all the talking. The village is acclaimed for its high elevation, well-concentrated soils ; thanks to the savoir faire of Benedictine and Cistercian monks of the Abbey of Cîteaux who planted the excellent soils with vines as far back as 1098. Also, due to its location at the the base of the sloped Côte d’Or as it is protected from the winds that can produce poorly rounded white wines. Famous for its intense floral and lively dried fruit aromas, we better serve Meursault’s white wines at temperatures between 12C to 14C. They are unbeatable when accompanied with seafood, poultry, and creamy sauces ; resonating strongly with the buttery texture that slides down the glass. Rule of thumb for Meursault’s Chardonnay: they hit their peak 4-6 years after the vintage, but can age for 10-15 years.